Observation - woodmouse on birdtable - UK and Ireland. Description: Nice photos of a woodmouse stocking up on seeds from a birdtable. Thought I may as well put them up. I was able to get suprisingly close to it the camera was only a few inches away from the mouse in the end! 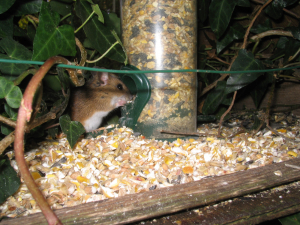 Nice photos of a woodmouse stocking up on seeds from a birdtable. Thought I may as well put them up. I was able to get suprisingly close to it the camera was only a few inches away from the mouse in the end!